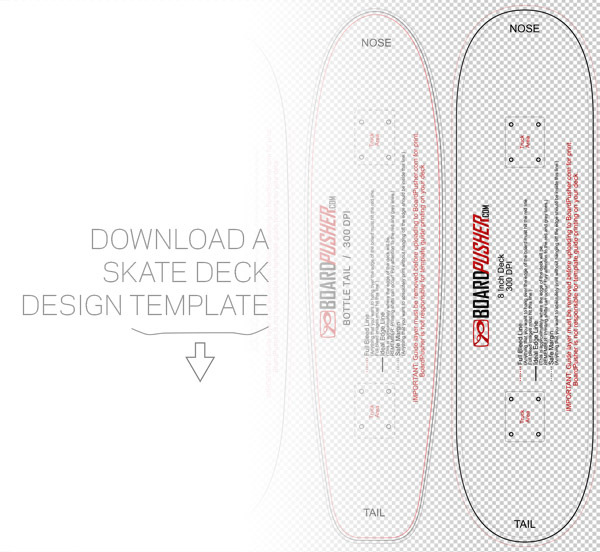 Download a skate deck template to aid you in your skateboard graphic design process. These templates will help you determine the size of your graphic and where the edges of your design need to be as well as the area that will be covered by the trucks. 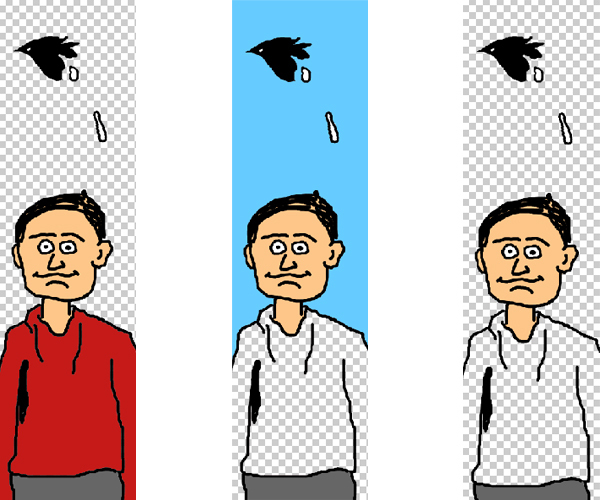 Choose your desired shape and use it as a layer in a design/editing program (Photoshop, etc.). 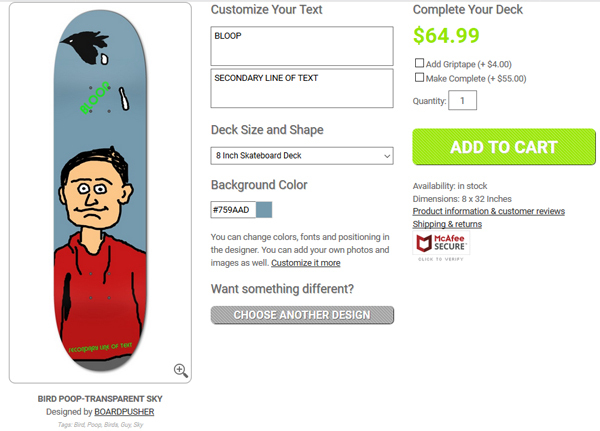 Just make sure you delete the template layer before uploading your graphic to BoardPusher.com. We’ve all been there, you wanna take your board, but it’s just a bit too big to lug around with you. BoardPusher.com has you covered with the mini-cruiser. Our latest limited edition shape is a sleek 7 1/2 by 24 3/16 inches so that it easily fits in your locker, your suitcase, or under a beachfront bar stool. Just like all of our boards, the mini-cruiser is a 7-ply Canadian Maple deck and a fun cruise with just enough of a tail to provide pop when you want it. 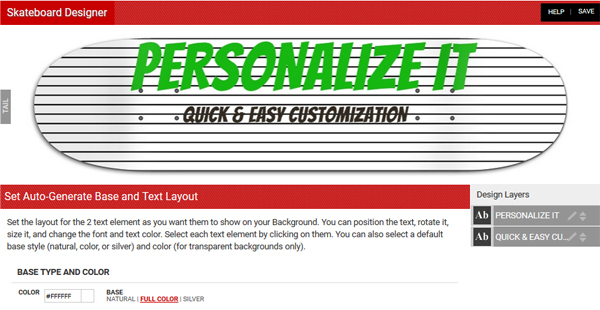 Best part is it is now available for you to create your own cruisable customized graphic. 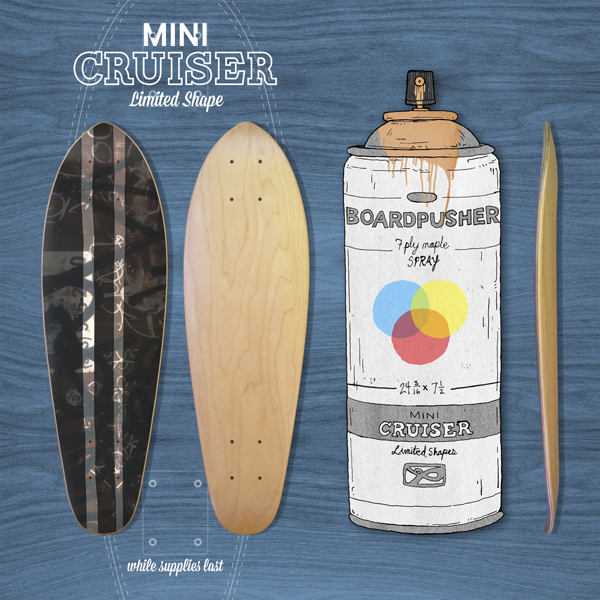 Begin designing your mini-cruiser in the BoardPusher.com Designer or download a template to help get you started. Remember, this deck is only available while supplies last. The winner of the “Tattoo Art” THI3D THURSDAY Skateboard Design Contest is “Love is in La Mer” designed by UK based artist Tim Naish. Check out more of Tim’s artwork at http://www.timnaish.co.uk. “Love is in La Mer” is now available alongside other winners in the BoardPusher THI3D THURSDAY shop where a limited edition of 10 boards with this graphic are now available. It’s that time of year to start firing up the grill next to a (hopefully empty) pool and get to feasting. 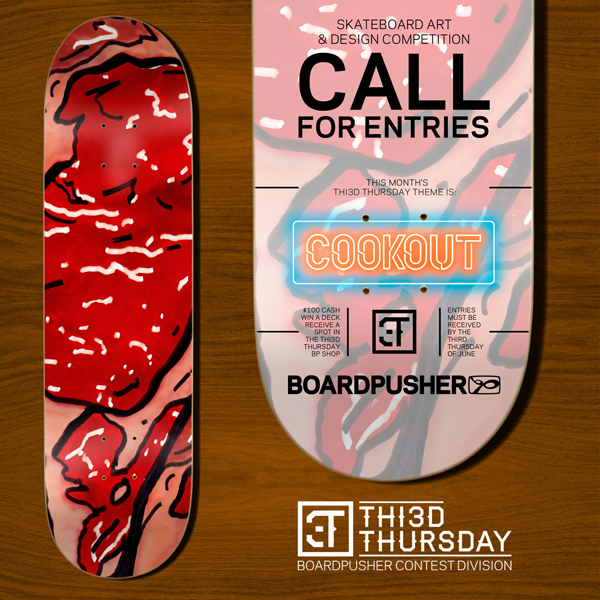 We would like to see you turn those hunger pangs into skateboard graphics for the June THI3D THURSDAY Skateboard Design Contest: COOKOUT. Just so we don’t end up with a bunch of hotdog graphics, we’re going to go ahead and allow you to use any shape deck and open the design possibilities to anything edible, just turn those skateboards into food. All entries must be received by Thursday, June 19th. What’s up for grabs is your graphic printed on a skateboard, $100, your design will be featured in the BoardPusher THI3D THURSDAY shop, and a limited run of 10 decks with your graphic on it available to the public. See past winners here. Check out the BoardPusher.com Contest Division to get started on uploading your entry. For full contest rules and detailed instructions on how to enter head over to http://www.BoardPusher.com/contest. GOOD LUCK! 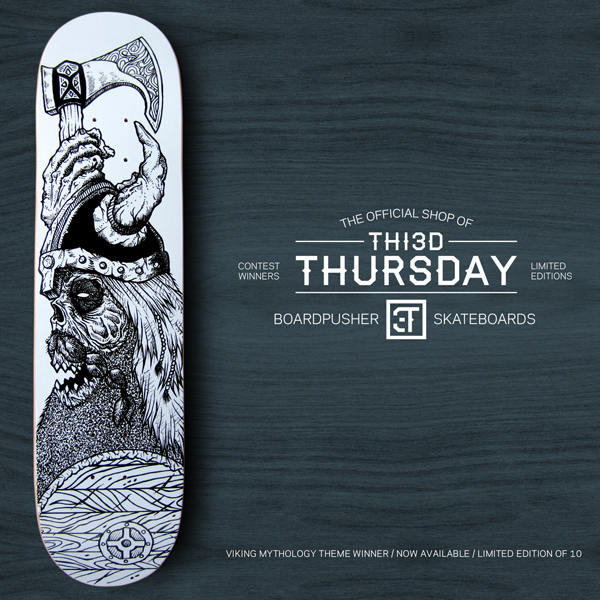 The winner of the “Viking Mythology” THI3D THURSDAY Skateboard Design Contest is “The Last Viking” designed by Peruvian artist Alexis Salvador. In searching for his own way of expressing his art he found it among zombies, creatures & monsters, freaks characters and Peruvian ancestors. Check out more of Alexis’s artwork at http://www.mylifeisinfected.tumblr.com. “The Last Viking” is now available alongside other winners in the BoardPusher THI3D THURSDAY shop where a limited edition of 10 boards with this graphic are now available. Street art and graffiti art have coexisted and often intertwined with skateboarding for decades and we want to see this balance continue. This month we would like you to design skateboards influenced by Street Art. Tags are okay, but we aren’t looking for some one dimensional sharpie doodle. We would also like to see more image based artwork depicting the bright colors and often far reaching, deeper messages of street art. Just make sure your design incorporates the theme in some way for it to be considered a valid entry. All entries must be received by Thursday, May 15th. What’s up for grabs is your graphic printed on a skateboard, $100, your design will be featured in the BoardPusher THI3D THURSDAY shop, and a limited run of 10 decks with your graphic on it available to the public. See past winners here. Check out the BoardPusher.com Contest Division to get started on uploading your entry. For full contest rules and detailed instructions on how to enter head over to http://www.BoardPusher.com/contest. GOOD LUCK! 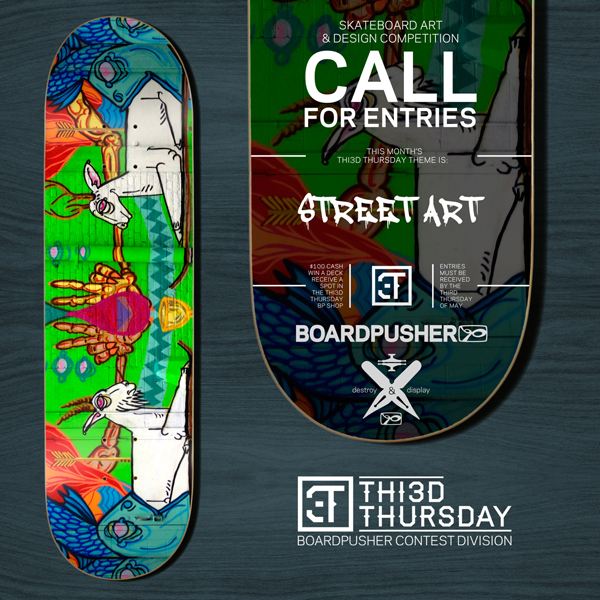 The winner of the “First Love” THI3D THURSDAY Skateboard Design Contest was designed by Spanish artist Carlos Hebles. Carlos used a popular European street art style to create his first love. He describes the inspiration of the design, “Sometimes the things you really love are the worst things for yourself.” You can see more of his work at CarlosAguilarH.blogspot.com. 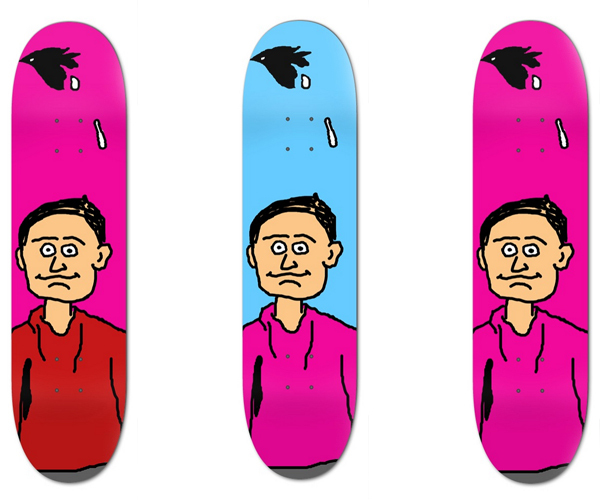 Carlos’s “First Love” design is now available alongside other winners in the BoardPusher THI3D THURSDAY shop where a limited edition of 10 boards with this graphic are now available. 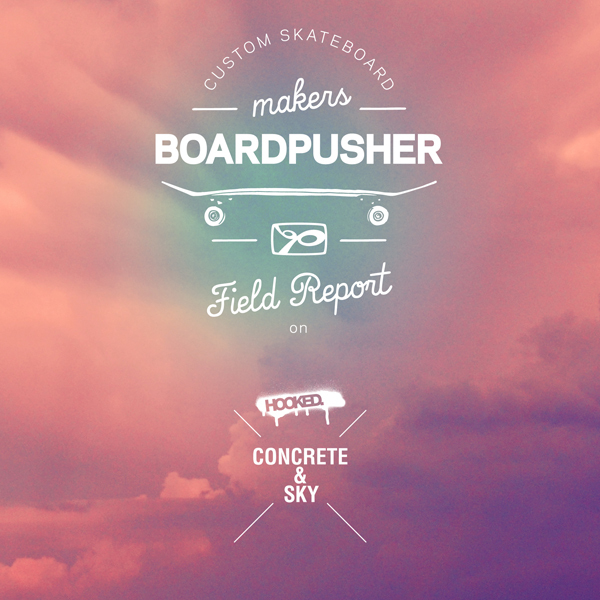 At BoardPusher.com, we are big proponents of the individuality of skateboarding and the creativity that goes into designing a skateboard graphic. We also get stoked when a clique comes together with a unified artistic idea to develop their crew’s own series of decks. It’s gratifying to be a part of the creative process that realizes a vision, especially when it’s in the name of progressing the skateboarding community. Hooked has established themselves as more than a skate crew, but as a skate organization pumping their time, efforts, and earnings back into their local UK skate community. Recently, they filmed their second skate video “Concrete & Sky” which will be debuting this weekend in Derby, England. 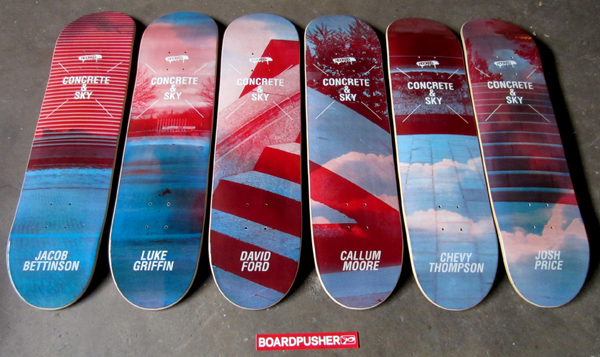 To commemorate the event, Hooked has designed a “Concrete & Sky” series for their skate team. This series is now available at BoardPusher.com/Hooked. To find out more about Hooked and “Concrete & Sky” head over to hookedskate.com. A pretty rad extra on the DVD is a spot guide which has mapped out every spot skated in the video. If you’re actually going to be in Derby this weekend, why not check out the event here. Below are a couple of trailers for “Concrete & Sky”. The winner of the “Cease and Desist” THI3D THURSDAY Skateboard Design Contest is “Chewy Skateboard” designed by Robert Goldberg. 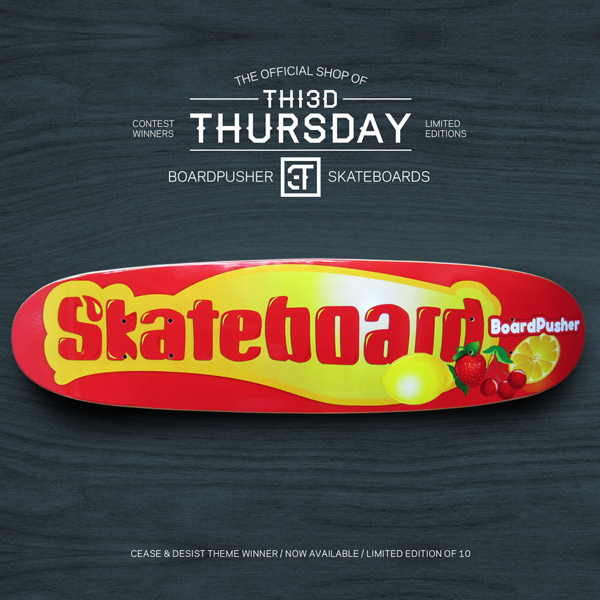 This really clever candy parody was actually designed on a cruiser shape so, “Chewy Skateboard” will be the first cruiser featured alongside other winners in the BoardPusher THI3D THURSDAY shop where a limited edition of 10 boards with this graphic are now available.